Ever wanted to add a date or name to something you’ve made? 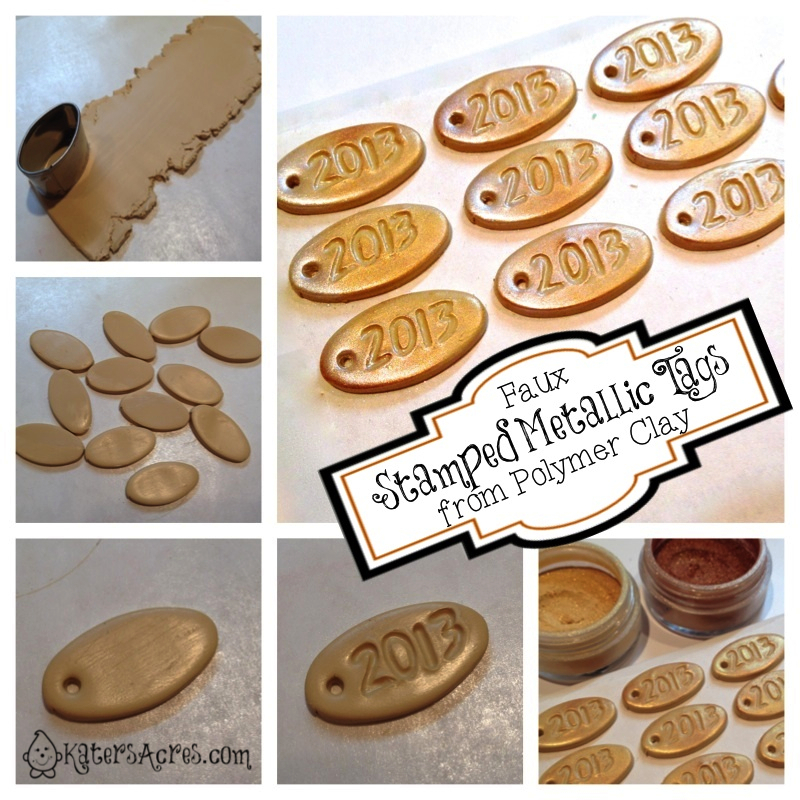 Here’s an easy way to do it, faux stamped metallic tags made from polymer clay. Cut off a 1/4 section of your Premo! polymer clay block. Condition this section of clay. Roll your clay through the 2nd thickest setting on your pasta machine. Use your cookie cutter to cut the number of tags you need for your project. Using your dotting tool, punch a hole through one end of the tag. Using your dotting tool again, write the year, date, name, or whatever else you wish on your tag. Use mica powders to add a metallic effect on your tags. Note: I have used gold, bronze, and a touch of pearl near the hole of each tag. Bake your tags in your dedicated polymer clay oven for 30 minutes at 275 degrees. Optional: Antique your tags before adding them to your creations. See this tutorial here on how to do this. ENJOY! Make these faux stamped metallic tags by the dozens and add some fun sentiments, names, dates, or other fun stuff for your projects, scrapbooks, or other clay designs.